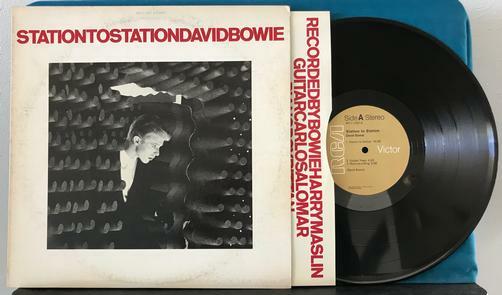 ORIGINAL 1976 TAN label 1st pressing with original cover image (a scene from the movie A Man Who Fell To Earth) that was later changed. Vinyl has a few light surface sleeve scuffs just holding grade back from NM, nothing I can feel. Labels are excellent. Original inner sleeve has light handling wear. Cover has cornerwear, light edgewear, heavy ringwear, and hazing. 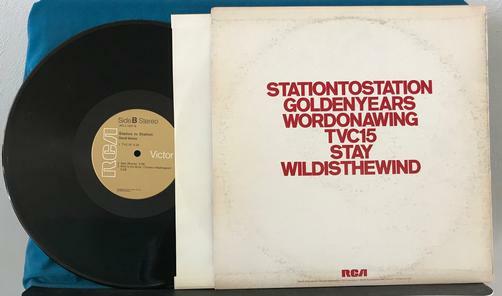 Songs: Station to Station, Golden years, Word on a Wing, TVC15, Stay, Wild is the Wind.